today we start officially a new collaboration regarding a very important topic in archeology: the food. As archaeologists, often working in our country or in missions abroad, we have the opportunity to collect many interesting data and to live important experiences related with food and drinking culture (both in Italy or in foreign nations). For this reason we decided to collaborate with an expert in this field, Dr. Lucia Galasso (you can find her websites under the twin blog section of ATOR) , who is working since many years on this important theme and who can use, reuse and analyze the informations we can collect under a different professional perspective and integrate our archaeological point of view. "With this post begins a collaboration between the blog ATOR (Arc-Team Open Research), edited by the archaeologists of Arc-Team, and Cultural Evolution. With cross blogging we will work on what is (IMHO) the closest topic to archeology (from an ethnological point of view): ethnoarchaeology and food. I already started this path a few months ago, approaching disciplines such as historical reenactment and experimental archeology, organizing events like "Ancient streets, ancient flavors. Food and hospitality along the way of the Abruzzi ". According to the Mediterranean tradition (but not only), we will start this adventure through a sacred gesture, sharing the main food, the bread, becoming in this way "compagni" (Italian for comrades), a word derived from "companatico" (Italian for pottage"), which means to be friends who eat the same food. Arc-team works very often in the Caucasian countries (Armenia and Georgia in particular), being able not only to support the archaeological excavations, but also to get involved in local traditions, which are often related to food and drink. 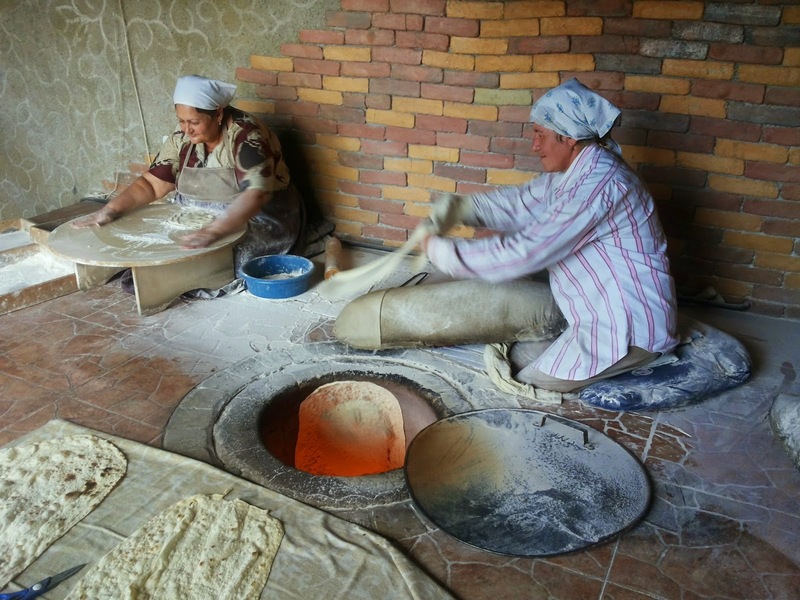 In Armenia they had the opportunity to observe and to document the process of bread-making of lavash, in a bakery of Yerevan. Lavash is the most popular bread, not only in Armenia, but also in other Caucasian countries, and its origin is very old. It s enough to look at its preparation to understand how this thin and soft bread without leavening, made of wheat flour, water and salt, can help archaeologists through ethnographic analogy, to understand not only the use of related archaeological finds, but also the historical context of the bread-making in these areas (although it must be said that many archaeologists have rejected the use of ethnographic analogies as a source of error and an incorrect analysis of the data). However the bread-making of lavash is fascinating: its thin shape (and we know that in bread the shape is always linked to a strong symbolism, or, as the great Alberto Cirese said, "shape does not feed: it conveys informations and not calories") is the result of the work of preparing the dough which is then further flattened against the hot walls of a clay buried oven, called "tonir" in Armenian. The cooking process lasts a few seconds, and gives a bread to be consumed every day as well as on special occasions; during weddings, for example, it is placed on the shoulders of bride and groom to wish fertility. I leave you with a short movie the archaeologists of Arc-Team provided us, waiting for more news on this fascinating country and customs and eating habits that characterize it." Last week, from September 4th to 6th, the 12th Brazilian Congress of Forensic Dentistry took place in Florianópolis. The biennial event featured conferences and workshops by forensic professionals from Brazil, Uruguay, Peru and USA. The attendees could also submit poster and short oral presentations to compete for the best academic works awards. 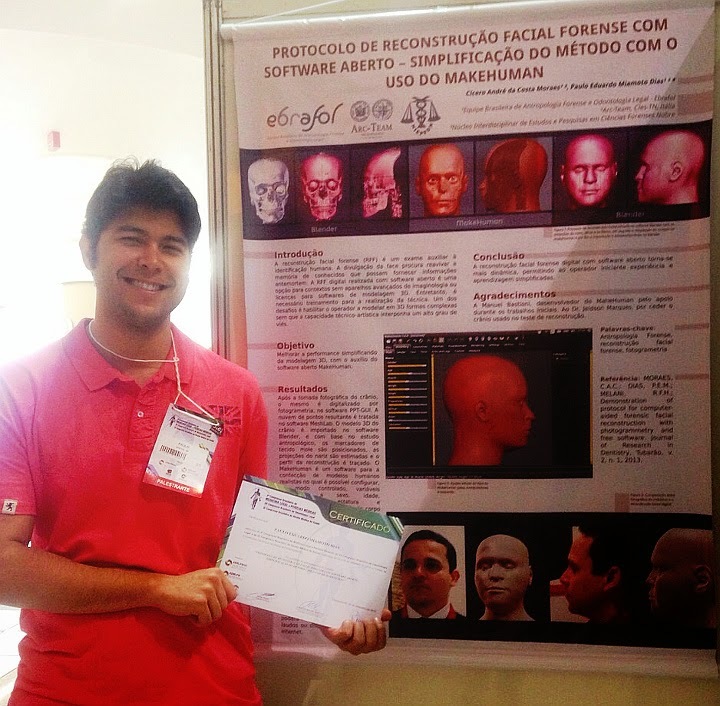 The oral presentation "Protocol for Forensic Facial Reconstruction with open software: method simplification using MakeHuman" was one of the winners. 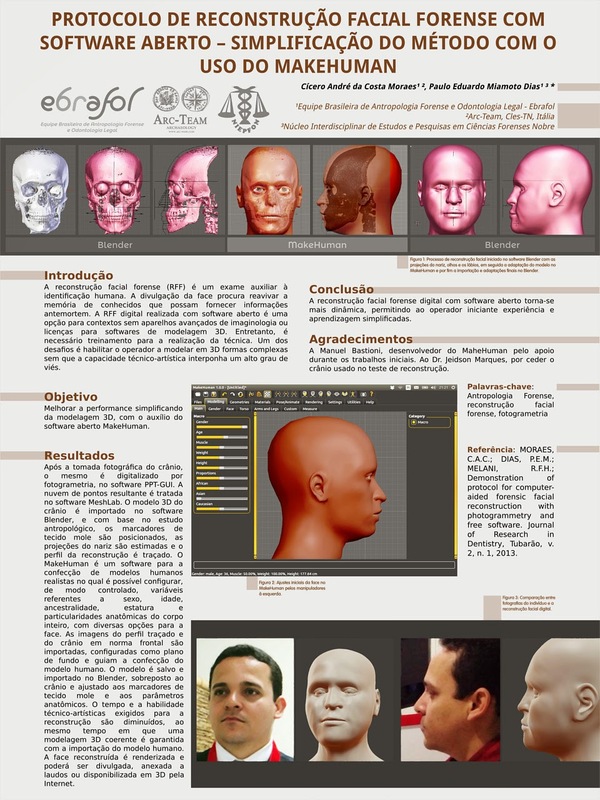 In this work, authors Cicero Moraes (Arc-Team member) and Dr. Paulo Miamoto explained how the application of MakeHuman to forensic facial reconstruction can aid this technique by simplifying and individualizing the anatomic modeling process, as well as allowing the operator to adjust the 3D humanoid template to soft tissue pegs and other objective parameters using the Blender export mode. The method was also presented at one of the official conferences of the event by Dr. Miamoto. Moraes, a 3D Designer, and Miamoto, a Forensic Dentist, are members of the NGO "Brazilian Team of Forensic Anthropology and Legal Dentistry - Ebrafol", a non-profit organization that aims the promotion of Human Rights by applying knowledges of the aforesaid sciences. One of Ebrafol's expectations is provide official forensic units with training on 3D technology using open software. Since 2006 Arc-Team joined the Aramus Project, an international filed school organized by the Universities of Innsbruck (FB Vorderasiatische Archaelogie - Institute of Ancient History and Near Eastern Studies) and Yerevan. 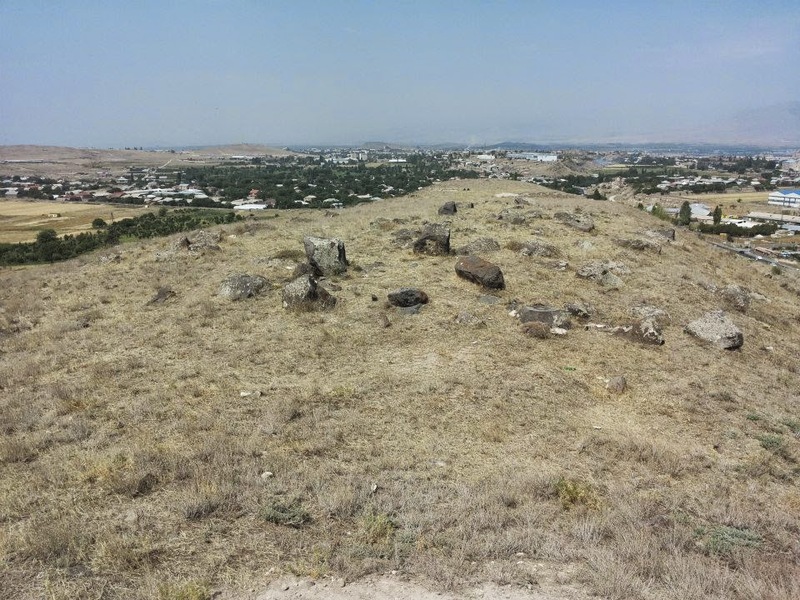 The excavation is located in the village of Aramus, in the Kotaik country (Armenia); the main purpose of the Field School is to introduce students to the practice of digital documentation, data recording, survey and archaeological analysis. To have a fast documentation we use traditional photomapping using the evolution of the Corte Inferiore method based on the single software QuantumGIS 2.2. Every evening we were able to finish the daily documentation. The picture below shows an example of photomosaic made of 11 images. To improve the quality and the accuracy of the documentation we decide to take zenithal pictures and process them inside the suite MicMac. The data acquisition was done keeping vertically the camera and shooting every step moving along a line. After the first line, we move a step forward and repeat the operation proceeding in the opposite direction. The picture below shows the pointcloud (Apero result) with the position of every single shoot (the black arrows rapresent the direction of the movement). We elaborated the images using the ground geometry approach of Malt. The results are an orthophoto and a DEM of the layer. The picture below shows the difference between a 2D photomosaic and the orthophoto. Due to the long time in calculation, we were not able to finish all the elaborations during the excavation time. We want to thanks Hansjörg Ragg (REDcatch GmbH) for the help in finding the best workflow inside MicMac. The ground geometry approach of MicMac is not the best choice when the layer has a complex shape, characterized by different horizontal and vertical faces. That is the reason why we decide to take pictures also for Python Photogrammetry Toolbox (Bundler + CMVS + PMVS2). 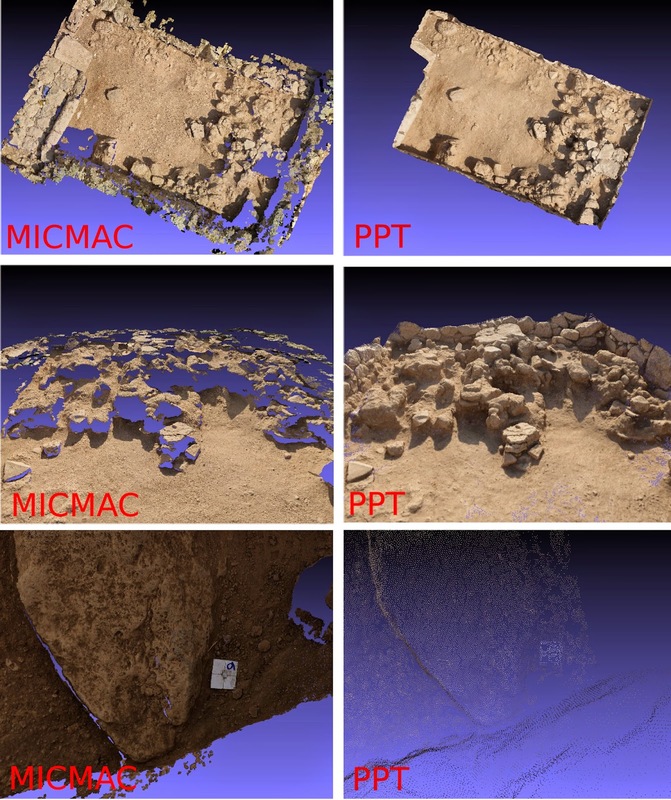 The picture below shows the difference between MicMac point cloud (ground geometry) and PPT pointcloud. The data acquisition is really simple: just take pictures from many points of view (picture below), paying attention to cover all the different faces of the layer (at least three images). 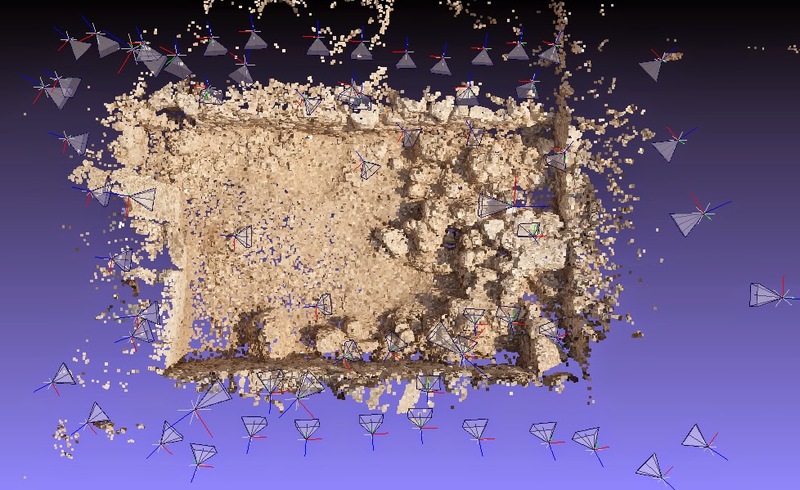 The raw point clouds were elaborated inside CloudCompare (cleaning and mesh) and Meshlab (mesh, texturing and reference). The picture below shows the final result of a broken jar. We were able to elaborate all the documentations during the excavation time. The three different type of documentation are perfectly compatible with the time of an archaeological excavation. The best way to work is to acquire first the PPT dataset, than the 2D photomosaic and finally the MicMac images (it has to be the final step because it is necessary to walk over the layer!). The GCP are the same for all the three techniques. i made a new videotutorial on the Reference Scene Tool of Meshlab 1.3.3. I used data from the Aramus Field School, a joint project between University of Innsbruck (Austria) and University of Yerevan (Armenia).